World is not Real ! The world is full of gunas (qualities). If there were no gunas, there would be no world. The whole world is not of just one type. Leave the turmoil of others. Great beings are born on earth to make right the minds of sadhakas. Whoever we are doing the work for, if the work is done in a pure way, they will be helped externally and our minds will become calm. Moksha won't come unless the mind is calm. From past few days I was not feeling well internally and externally. I was suffering from ill health and that impact had on my mind. Some distress dissatisfaction thoughts were on my mind. I decided to visit Nannagaru, and was waiting for right moment. On one fine day I left to Jinnuru. "I used to be in peace and happiness amidst of hard circumstances too, but today that peace and happiness is not there. I have disturbance,distress,worry,fear in my heart,you are my savior,you alone can save me from this sorrow"
I handed the paper to him. Nannagaru - How is your health? "The reasons all you told were because of your attachment with body. You are much attached with the body." He continued and gave a sermon for one hour. If you are having fear, it implies you don't have faith in god. Then he spoke few words about Rama Krishna. Rama Krishna, when his mother died, he cried a lot, and he said - "Oh Mother! Your womb is going to be buried. Your womb is so precious and pure. If it isn't so pure, how would I be born?" "Sasi, When you spit something do you look back at what you've spat? so easily I left the body. 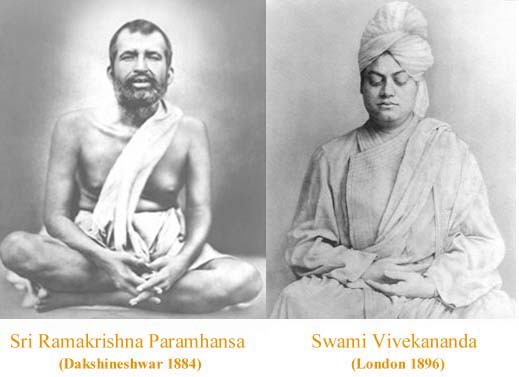 Vivekananda - who are Mahatmas? Mang - Rama, Krishna, Shankara are Mahatmas. Vivekananda - My Guru is greater than these Mahatmas, hence I am unable to speak about my Guru. All the words that I try to speak about my Guru will be less, and by my words I don't want to degrade his greatness. That's the reason I am teaching about Upanishads. I said, when some hard circumstances arrived in past, the subject helped me, but today when some disease attacked my body, I am getting disturbance. He looked at me and said - "If you are very healthy do you live for 1000 years?" Serve food to the body, bath your body, take medicines, do your daily duties and don't think about body. If your hand or leg pains are going to your mind, definitely rebirth would come. With these words, we had to disperse, I offered prostrations to him, he blessed me. During evenings I visit temple which is near by. That evening, I left from home little late and by the time I reached, the temple was closed. The same day night I heard Nannagaru was leaving to Hyderabad, so generally when he departs to hyderabad, the train passes our station and halts for few minutes. So I go to railway station to visit him whenever he leaves to Hyderabad. On the next day early morning I hurried to the railway station, and as I stepped, the train passed, was little disappointed. By all these incidents that happened I confessed myself about the mistakes I've made, and suddenly immense faith on God and Guru emerged which disappeared after my ill health. All the time Nannagaru used to appreciate the good in me and the sadhana that I was doing. Yesterday but when he pointed out my weakness I felt that was also for my good sake. Without Nannagaru pointing out my weaknesses I wouldn't have been rectified. Having recognized my weaknesses, I feel peace in my heart now. Guru alone shows your strengths and weaknesses and also gives you an intuitive intelligence to mold yourself. Lakshmi is a profound devotee of Nannagaru. 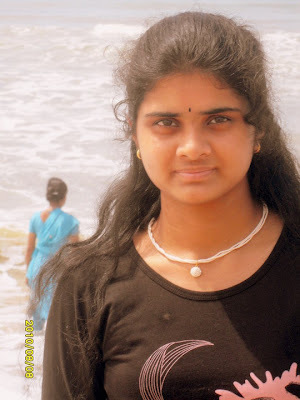 From her very childhood, since at the age of 5 she had devotion to Bhagavan and at the age of 24, she came to know about Nannagaru, and worshiped him as Guru. She follows surrender path, and abides to the will of Guru always. She always resides in peace irrespective of the circumstances that take place. The most attractive thing in her is her vivacious nature which is as natural as her beauty. Her actions and words are always in harmony. A true example of devotion can be seen from her. One should be careful in thought, word and deed. The work that is done should be pure and unwavering. God won't see whether the work that is done is big or small. Even if you sweep the veranda it is enough. We consider that the work of one who looks after accounts is great, but the work of one who sweeps the veranda is small. But, God will give moksha first to the one who does his work properly.If the District Collector does not do his work properly and the one who sews chappals does his work well, then God will give moksha to the one who sews chappals before the Collector. We must put the mind carefully in the work we are doing with hands. One should not impose limitations thinking, ‘These people are like this, those people are like that and we should also be like them.’ We should be calm. In the same way that a living being has a body, the world is like the body of God. The whole world has many different kinds of human beings. We should learn to live in the midst of all these types of individuals without spoiling our mind. The people in our house are of several different types. We should see that we soothe our mind whilst in the middle of all of them. Atma jnana will not come without the mind becoming calm. 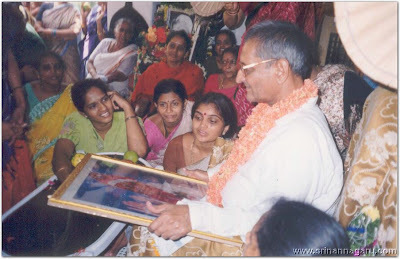 In 1996, we used to live in G medapadu - a village in East Godavari Dt, Andhra Pradesh (South India). My wife used to participate regularly in satsangs. Once I asked her what is the name of your GURU? are trapped". That was my first opinion on Nannagaru. I dint like her going to satsang, but silently I did let her go with dissatisfaction. But on one fine Sunday, while she was going to satsang, she gave a book through a window and said "You will not believe my Guru, at least read this book", and she left. “In the presence of guru, if the wandering of your mind is not stopped, if you do not feel peace, happiness or bliss, it is not fault of yours. It is the fault of that guru”. This statement of Sri Nannagaru has completely changed my mean opinion. 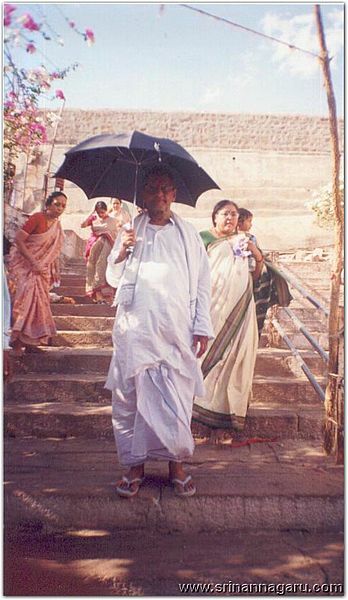 darshan(sight) of Sri Nannagaru, with family”. I thought -"Just now I started believing him and he is offering me his darshan". My heart exclaimed as "Oh Wonderful Guru!". As proposed, we went to kakinada. 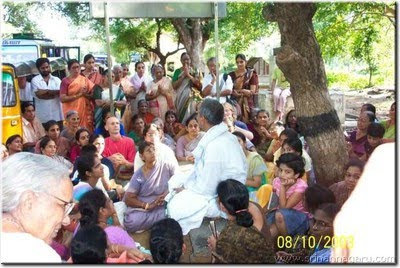 Approximately hundred devotees gathered in a Devotee house. First time I saw him, I felt "How simple he is, I could see the simplicity in both his looks and words". I was slowly attracted by him. karuna(grace) is really unexpressed, he glanced at me and directed that glass of fruit juice to me. He asked me to drink it. I felt embarrassed in front of huge number of devotees, and that too someone brought the juice to him with great devotion, I was in hesitation to take the juice. “Take it as prasadam (the term for food which has been offered to a deity and distributed to worshippers), don’t hesitate“ followed by his enchanting smile. Now I got my doubt cleared, I got the answer- why he is called as NANNAGARU. 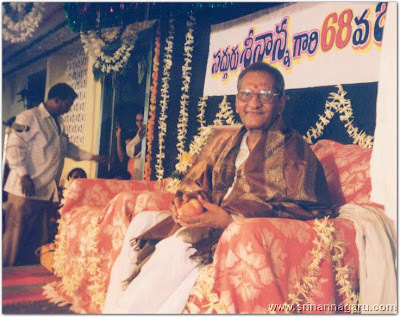 The soothing affection in his voice, looks, smile, all these made him to be called as "SRI NANNAGARU"(Beloved father). This unforgettable incident changed my total attitude up to the extent that, only Sarvantaryami(who exists everywhere) SRI NANNAGARU can assess. My words cannot explain. Sri Nannagariki Padabhivandanamulu. (My prostrations to Nannagaru's holy feet). Thank you Gopal Rao Garu, for sharing the beautiful introduction you had with Nannagaru.Your repentance is a lesson to all of us. This note emanates his grace on devotees. Without having the mind disciplined, don’t expect that someone will come and save you. Doing sadhana while letting the mind loose is the same as taking inappropriate medicines for an illness, and noticing that after a year the illness has not decreased. If the mind is let free, though sadhana is done, moksha will not be gained or attained. However, ‘Who should be told?’ was another question. His inner voice said, ‘It is good if you tell the ones who had faith, served you for six years and then left’. So he went to Sarnath searching for those disciples and that was the reason that the Buddha went there. It was at Sarnath that he gave his first speech to his disciples. Gautama Buddha never gave importance to miracles. He even used to go to his own house for bhiksha(begging). This is not a small thing. It is easy to speak things, but only if we ourselves do such a thing, will we know just how difficult it is. We say moksha. The Buddhists call it the state of nirvana. When we get sick, we take medicines, don’t we? Does the illness go away or not? We observe that. Just like that, we always have to observe ourselves: are we giving discipline to the mind or not? If there isn't discipline in the mind, regardless of the number of pujas or japa we do, all are useless. Due to the body having the organs of the senses and the mind, the world seems as if real. But the world is not real. We are in a dream; therefore all seems to be real. We came for the sake of training. Truly, we are not paying attention to the mind. We are satisfied that for some time we did pradakshina of the mountain or went to a temple. We have thrown the mind to the wind and we are unable to know that due to this, we are bound. It is the mind that is responsible for whether we are bound or if moksha comes. I had many conversations with Nannagaru.If I had any doubts, I used to not wait, immediately whenever I had a chance I used to go and ask him. Nannagaru also, by seeing curiosity in me, he used to answer the questions patiently and also encouraged me to ask questions or doubts. I used to be first in asking questions. Even in college days also I used to do the same, the answers and experiences are making me to drive my life positively,happily and peacefully till date. I wish to share few of them here. It was in 1995 I think, I was feeling very unrest and dull on one day. So I just fell asleep in the afternoon time. 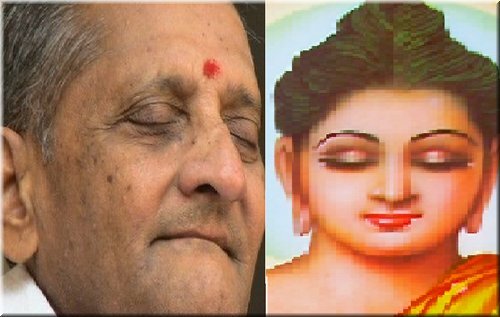 I got a dream, in which Nannagaru came as a big man or avatar. He just stepped into myself, and filled happiness into my heart and mind. I dint knew that I slept for so long time, and the day long I was in peace even doing regular activities. Myself - Namaskaram Nannagaru ! We recently got a new phone connection to our house. Nannagaru - Very good ! We are going to Arunachalam amma. Myself - Nannagaru, Please get me a well written book of Sri Ramana Maharshi Biography. 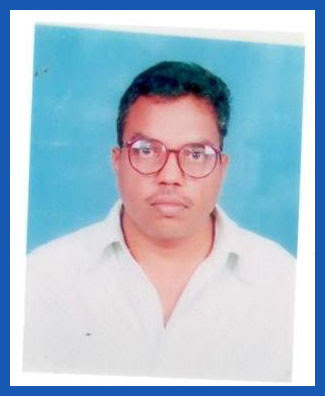 After 5 days Nannagaru itself called me and said he came to Hyderabad and is in Madhuranagar. I was so excited to go to Madhuranagar and meet him. 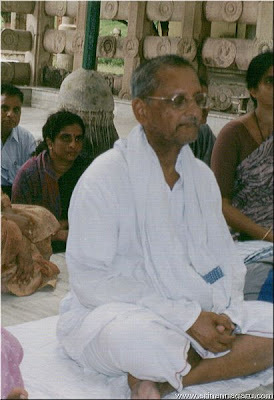 By the time I went, there were many devotees sitting around him, and I felt like he was waiting for someone. As soon as I went he warmly welcomed me and vehemently advised to sit in front. My heart felt with joy and happiness. He also said you were always in my remembrance. How blessed it is to be in remembrance of guru, it is all his grace I felt. Later he gave me two books, "Ramana Maharshi Biography" and also "Periya Puranam book". From that day my journey with Nannagaru has started in Hyderabad. Nannagaru - God, inner soul , Guru all are same. Myself - My intellect is unable to accept the reality of these words. Nannagaru - By experience you will understand these words. Today, I accept his words that these three are one. He gave those experiences and made me realize that all these three are one. My life is full of Nannagaru. 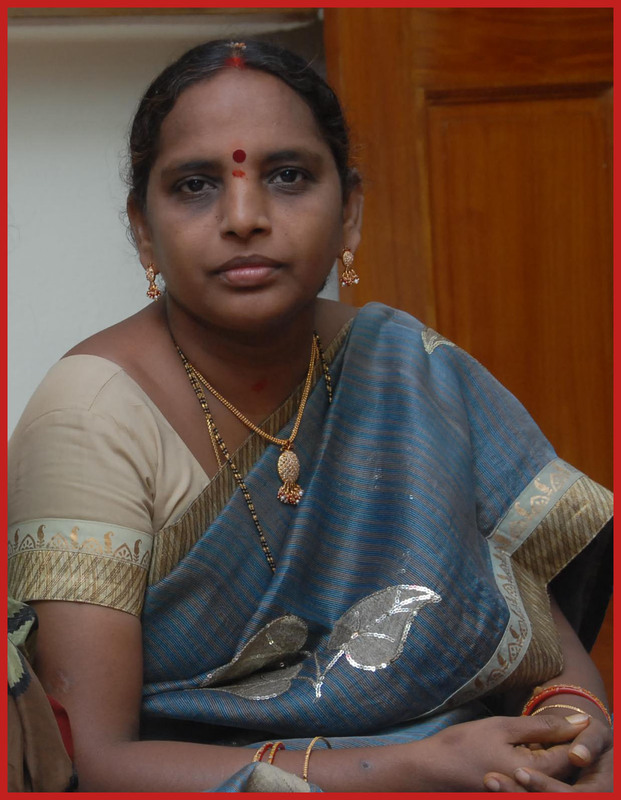 Myself - Bhagavan gave self realization to her mother. Did Bhagavan give moksha considering her as a devotee or as a mother? Nannagaru - If you have similar devotion and faith as bhagavan mother had towards Bhagavan, he will not wait a second to give moksha to you. 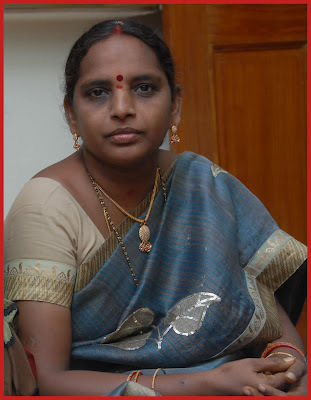 Nannagaru - How are you Lakshmi? Are you happy? Are you getting sorrow for any circumstances? Myself - Nannagaru, Sorrow doesn't have courage to face Guru's grace. Your grace is a shield to my heart and mind, which protects from sorrow and unhappiness. These are the few ones which I remember now, I shall share more experiences with you'll apparently. If the mind is not put right, Atma drishti won't remain steady. The mind will not become subdued by doing pujas and japa over time. It is good to do pujas and japa with reverence for Eswara (God). However, it must be observed whether the mind gets subdued through that or not. It should be seen that there are no faults (defects) in one’s thoughts and work. Do not keep the feeling of difference between enemies and friends. Whoever you talk to, you should talk wishing for their welfare, but don’t talk with emotion. Brindavanam is the most pious meeting place of Radha and Krishna (Devotion and God). Many people say Radha doesn't exist it was an imaginatory role, but that isn't true. Radha exists, and she is an ideal devotee which exemplifies true devotion. 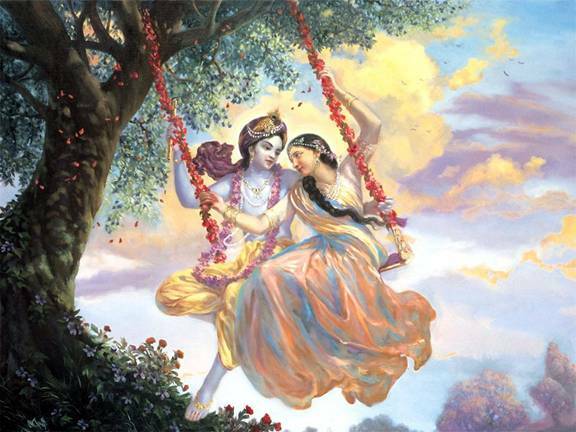 Radha and Krishna do not possess physical relationship. They have divine relationship. Radha does only that which Krishna likes, nothing else. A word she spoke was for Krishna, a expression she expressed was for Krishna, an action she did was for Krishna, a smile, a love it was just for loving krishna, such pure love who can give other than Radha. Behind every action she did for the sole purpose of Krishna. She lead a life how Krishna has preached. They had pure, unworldly, divine love towards each other. We should have Radha as our ideal, our guru (preceptor). Radha's love towards Krishna is pure Love, Divine love, unworldly love, without any expectations or reservations not for any material or spiritual knowledge. Love only for Love, only Krishna, only for the comfort of Krishna, Loving only for Love, Radha's every work is only for Krishna. Radha never expected even goodness from Krishna. Radha never expressed her Love, She Loved only for Love. Love only gives. Radha - ideal, True, divine love, unworldly love, endless love towards the Lord. She is Radha. Body - boundedness melts when you think of God, Like Radha, by constant remembrance of God Krishna, finally there is no Radha only Krishna remains. When we have pure love as Radha had towards Krishna why wouldn't we attain salvation? Even Radha dint wish for salvation, she just loved him for love. Changing clothes or changing bodies or becoming Sanyasi is not important, eliminating useless thoughts, tendencies, impressions for they are binding, therefore it is very important to remove the very cause of them. Gain self-knowledge and you will gain all the Bliss, Truth and that ultimate state. Do your work with hands at home, keep the mind fixed on God. Be Good Do Good. When contemplating Any good word or verses from the Bhagwadh Gita will surely safeguard and help you at the time of crisis. Your faith in Me(God) should be so strong, your Love in my Lotus Feet so pure and deep that I will bless you with good intellect and remove all the evil thoughts in you. Fix body and mind, have they helped you, cooperated you to know God. QUESTION YOURSELF BEFORE SLEEPING. A devotee namely Bujji(nick name by which we all devotees call him) looks after Nanangaru needs. He records his speeches, makes casettes,cd's etc. 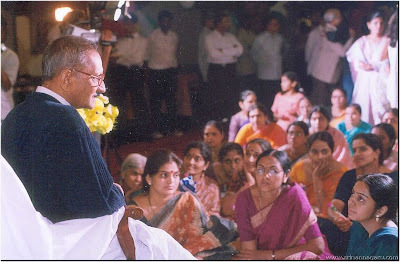 He posed a question to Nannagaru - "How all devotees can become equal infront of Guru?" 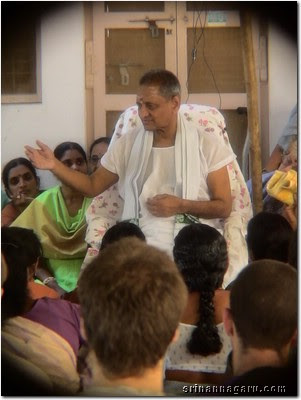 Nannagaru said - "Externally it might appear all devotees are not equal, but inside of guru all devotees are equal". The crowd gathered filled with happiness and joy, we all expressed joy by appalause. He said "Speech is silver but silence is gold. You all want silver but not gold. You always want me to teach you the subject(spirtual discourse) in words. You like to listen my words,but you don't like my silence(mounam)". He continued - "Don't talk about our subject(spirtual discourse) to the people who can't understand. If they dont understand some might leave those words, but some people will leave foot stamps on the words. Pigs don't know the value of diamonds. Do they? This is very strictly instructed by Lord Shiva. Don't teach about the subject to those people who can't even understand a bit of it. Lord shiva's grace is required to understand our subject. Also Don't tell them - " I know the subject but I won't tell you because you can't understand it. ", this is unnecessary for us. One of our devotees asked Nannagaru - "You are saying that silence is gold, how can we reach the silence and receive gold?" He was in silence for few minutes. After few minutes he addressed the question - "You don't have right to Eternal Knowledge(jnana). To reach the state where you can understand jnana, you have to do actions(karma) without ego. Your actions should be without expectation from others and with devotion. Guru's grace is needed to understand this Eternal knowledge(jnana)". Everyime when Nannagaru was showering grace, we could see the finger was up. Indeed he is full of grace. Always at his holy feet. Gandhiji’s friends taught Gandhi the habit of smoking cigarettes. He used to take money from home without his elder’s permission. His father never doubted him. Once his father casually mentioned to him about the missing money. Then Gandhi confessed that he had stolen the money and promised never to lie or go against his father’s faith in him. He never stole again in his life. 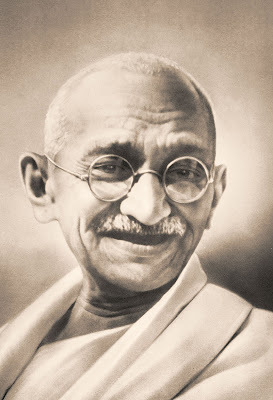 His father’s faith made Gandhi a mahatma. Gandhiji was ready even to give up his life for a good cause. If he made any decision, some people agreed to it and some people did not agree. However, after thinking that it was a good cause, he did not pay attention to anyone else. Gandhiji policy was, Do or Die. After taking a decision, it could not be avoided that many people opposed it. But by the time it was put into action, everyone followed him. Nehru also did not agree with Gandhi on a few matters, but when it was put into practice he used to listen only to Gandhi’s words. When you get unified with everybody then you cannot remain without loving the creation. Your Love will then flow all over and your ego-sense will leave. But your Love is limited to your family. You think that this body is mine, so the Love is limited. Body itself is untrue. A sage loves everybody, His Love is boundless, limitless. A sage accepts all the sorrow and grief of the world whereas you distribute all your sorrow and grief into the world.